One day in 1979 I put a cowboy hat from a Johnny West action figure and a scuba diving mask from a G.I. Joe on a Timbit. Then I took a photo of it. Such was the boredom of my youth. Since then I would happen upon this photo — a Kodachrome slide — every handful of years, and I’d chuckle at it and put it back in its box. It is a ridiculous and meaningless photo, but over the years it became a sort of talisman, and I couldn’t throw it away. Now, almost four decades later, I feel like it has time-warping properties, as if on every viewing, spacetime folds and those collected moments come together and touch. In many ways I feel haunted by this photo. Between viewings I tend to forget it exists, and then one day I’ll see it and it all comes back, like the mixed emotions of seeing an old friend and realizing that the old friend is still an idiot. Why couldn’t I have an interesting talisman, like a spider encased in amber, or a jewel-encrusted monkey skull? 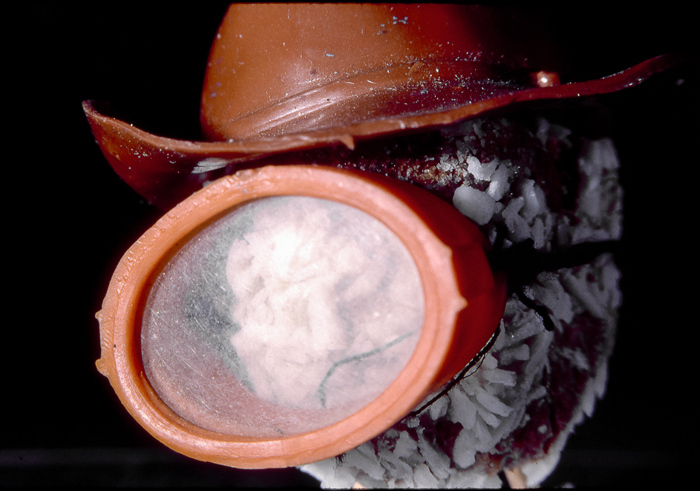 Let me remind you; this is a photo of a goddamn Timbit wearing a cowboy hat and a scuba diving mask. It is meaningless. Or is it? Perhaps this was the beginning of a surrealist art career, and in a parallel universe I’ve graduated to bagels wearing Hugo Boss suits. I’ll never know. But I feel it is finally time to break the spell of this mysterious image by showing it to the world. Here you go. Now I am free. Long ago my brother-in-law brought back from a trip (New Zealand? I can’t remember) a coconut head. I mean it’s an empty coconut, but decorated to look like a (creepy and small) human head. One time he needed his mother to pick up a friend of his at the airport, someone she’d never met. He made her carry the coconut head so the friend would find her. I guess I’m saying you could do worse with your talisman. Not *much* worse, perhaps, but worse.